This article illustrates and describes a few examples of Dan Theus's "art points." He is recognized among his peers and collectors of modern lithic art as one who has reached a high level of flintknapping skill. Dan's signature points are Clovis and Cumberland points. He has produced some of the largest Cumberland points that have ever been made in modern times. "He has worked hard to learn his craft and does the complete line of knapping." ---------2003, by Chips staff, "Chips, Vol. 15. #1," p. 6. "He can pressure flake an outstanding point, and loves to do grind and flake-over work also." ---------2003, by Chips staff, "Chips, Vol. 15. #1," p. 6. "Dr. Theus has been a wonderful asset to the hobby and has done much to promote knapping around the country." ---------2003, by Chips staff, "Chips, Vol. 15. #1," p. 6. Stone Age technology is alive and well in our 21st century. 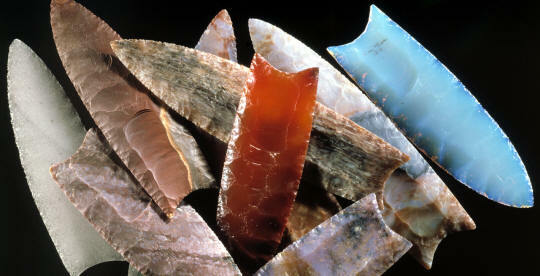 There are currently many active flintknappers in the world and the numbers continue to grow. 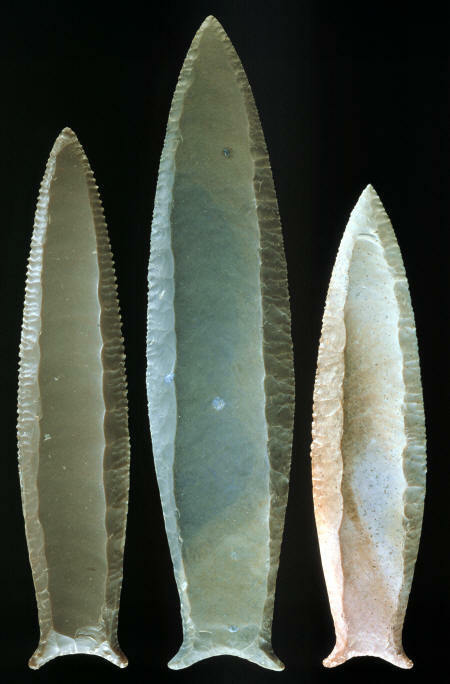 Some people are knapping for fun and making average examples of points that copy different ancient point styles. Other people are duplicating the ancient points precisely as an experimental archaeologist would do to rediscover old technology. Still other knappers are doing very fine lithic art pieces. Dan Theus would fall into at least a couple of these categories. These ten colorful Clovis points were made by Dan Theus. Each one is made of a different material. The materials are fulgurite (lightening struck sand), Alabates, Horse Creek chert, red Carnelian agate, Flintridge, petrified wood, and a fancy & rare type of glass. The longest point is made of petrified wood and it measures 6 inches 15.2 cm) long. 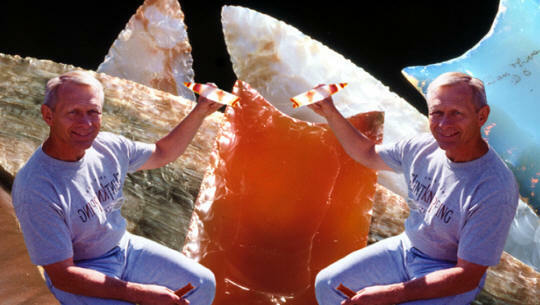 Dan Theus is well known in both the flintknapping community and among people who collect modern lithic art. His points have sold for several hundreds and multiple thousands of dollars. A few of his better examples can be seen throughout this article. This beautiful Clovis point was made by Dan Theus. It's made from a colorful piece of purple amethyst sage agate. 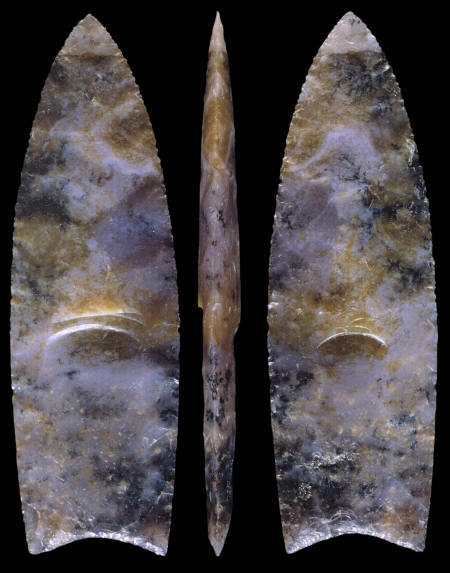 This Clovis point measures 4 7/8 inches (12.4 cm) long. Dan always wanted to know about flintknapping ever since he was 6 years old. His knowledge of flaked stone artifacts began at an early age when he lived in Rock Island, Illinois. It was there that he began to find ancient points in the surrounding countryside in creeks and plowed fields. These three large Cumberland points were made by Dan Theus and the point in the center is the largest that he has made to date. The long channel flakes were pressured off with a mechanical fulcrum jig. The center Cumberland point is made of hornstone and it measures 9 3/4 inches (24.7 cm) long, 2 3/16 inches (5.6 cm) wide and 7/16 inch (1.1 cm) thick. The Cumberland point on the left is made of Pedernales chert and measures 8 1/16 inches (20.5 cm) long and the one on the right is made of agatized coral and it measures 7 1/8 inches (18.1 cm) long & 1 11/16 inches (4.3 cm) wide. Dan Theus has had a successful career as a dentist and is now retired from his practice. He also has a degree in electrical engineering. In his early years in high school he was on the wrestling team. He began weight lifting in college and in 1976 he won the state weight lifting championship in Texas. 2003, Chips staff, "Chips," vol. 15, # 1, p. 6. 2007, Personal communications with Dan Theus.